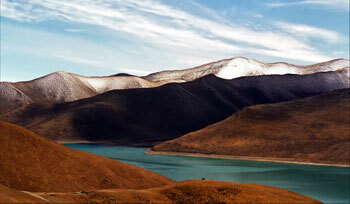 Tibet is full of rivers and lakes, which provides abundance of hydroelectric power and aquatic products. Bushy banks of the rivers and lakes are the homes of swans and geese.If you do not watch your step,you might stride on their eggs.On the banks of the salt water lakes,there are great heaps of alkali which also contains niters and borax. As long as 2,057 km, the Yaluzangbu River turns and twists like a silver dragon from the west to the east into the valleys of South Tibet.It runs through Muotuo county.After a 90-degree turn,it empties into the Indian Ocean.People could have a good time with their yak hide boats on canoes in the upper level of the River with going down to the lower level is quite exciting and challenging. A Holy Lake The lake is situated 30km southeast of Mt.Holy.It has an area of 400 square km.The Buddhists believe that the lake is the bestow from the heaven.The holy water can cure all kinds of diseases,wash people clean and get rid of people's worries.After walking around the lake and taking baths at the four bathing Gates,the pilgrims can be free from sins and can be bestow happiness.The great monk Juan Zhuang praised it " the Holy Lake in the West Heaven". Not far from the lake stands Mt.Holy.It does not only attracts pilgrims but also many tourists from home and abroad. The Yangzongyong Lake is within Langkamu county, with an area of 638 square km and a coastal line of 250 km.The deepest point is 60 meters. There is plenty of natural fodder for the fish in the lake. The lake have a fish reserve of about 300 million kg. That is why it is called "the Fish Store of Tibet". A lot of colorful ducks and geese are swimming on the surface of the lake. The coast of the lake is an ideal pasture. All these make an intoxicating quite picture. With an area of 1940 square km,the Namu Lake is the 2nd largest salt water lake. In the lake there are 3 islands, which is an ideal habitat for all kinds of aquatic life.One of the islands is made of calcareous sandstone. It is characterized by the stone pillars,natural stone bridges and the stalactite caves. The beaches of the lake are a beautiful natural pasture. Wildlife is having a good time there. Come in a group and get special discounted price. You will be regularly updated if anyone join into the program that you are intrested in. Duplication of any writeup and photographs or any other materials from this website without written permission is strictly prohibited. © 2018 - TibetTourOperator.com. All right reserved.